Great White Egret, American Egret and Large Egret. — These large birds can be up to 3-1/4 feet tall when standing. — Adult Great Egrets can have a 5-1/2 to 7 foot wingspan. 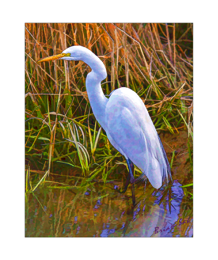 — Despite their large appearance the average Great Egret tips the scales at only 2-1/4 pounds. — Favorite foods include frogs, fish, crayfish, snakes, lizards, small mammals and insects. — Great Egrets use their bills to spear their prey. — Great Egrets are not noisy birds - you'll likley only hear them when they're disturbed or breeding. — Frilly ornamental feathers off the back means that it's breeding season. there can be a variety of reasons for nesting in a group, most feel it's a means of reducing predation. — Both the male and female take care of the young after hatching. — The average Great Egret life span is 15 years. 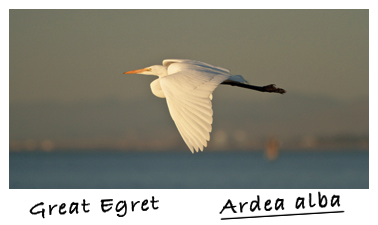 — Birds are in the class "Aves"
— The Great Egret is in the heron family "Ardeidae"
— It's genus is "Ardea"
— And the species name is "Ardea alba"